This weekend was it for the underdogs of the Monster Energy NASCAR Cup Series. No longer will they end their interviews with, “We still have Talladega out there, so we’re looking forward to that.” And no longer will they have more than a slight chance at scoring a victory in 2018. This final restrictor plate race of the season at Talladega Superspeedway brought many surprises to the sport. Whether Stewart-Haas Racing’s near-perfect ownage of a 500-mile race, the number of single-car incidents on the day or the last-lap flag call, Sunday (Oct. 14) also shuffled the underdogs’ day as well. Mechanical issues hit hard in the opening laps and the four green-flag runs of 20 laps or more made it tough to make those quick jumps to the top five. And with the top four spots far away with the lead at times and the remainder of the pack simplifying to single-file lines, no progression was made for most of the day. That’s where Sunday got interesting. Contrary to the nature of racing, the drivers who raced on Sunday were punished. How? Because running side-by-side and passing each other (which was done from fifth on back) simply decimates your pace in relation to the top four running in unison. Unfortunately, no other team was able to mirror SHR’s perfection. Not even Team Penske, who had their three cars and Wood Brothers affiliate in a wad amongst the top 10. So, when you look at the small teams, Sunday was a whole different kind of tough for teams who don’t even field a third car. For the ninth time in 2018, AJ Allmendinger is the Frontstretch “Underdog of the Race” after finishing sixth after 193 laps. This JTG Daugherty Racing driver started 23rd and rallied late to score his fifth top 10 of 2018. Now, Allmendinger’s case is interesting in how he used to (and may still) hate plate racing. Flipping and flying in this race in 2010, along with another rollover in the spring of 2017, the 2018 free agent has actually been among the most consistent plate racers in the sport, finishing top 10 in six of the last nine plate races. But Sunday was only his second from Talladega in that span and was only his third ever in 18 starts. Another guy who has seen the best and worst of ‘Dega is Regan Smith. This guy suffered a brutal, controversial loss in 2008 when he passed below the yellow line to win the fall Cup races. That win was quickly stripped following the move. Nice enough for Smith, he got to finally hit Victory Circle in 2013 in the XFINITY Series and was given another shot at the circuit on Sunday for Leavine Family Racing. His sixth start for the team this year, he now owns the No. 95 Chevrolet in 2018, running the final five races in place of Kasey Kahne. Sunday was another solid day for Smith in that car, running top 20 throughout the day and crossing the finish line 10th. The top 10 was his first since 2016 and only the team’s second of 2018. Smith has now finished 21st or higher in five of his six starts in the No. 95 with four lead-lap finishes. Kahne never put five top-21 finishes in a six-race span at any point in 2018 and had just seven lead-lap finishes in 25 starts. Brendan Gaughan is another recent XFINITY full-timer and made the most of a two-lap run to the finish on Sunday. The veteran brought his Beard Motorsports No. 62 from 28th on the grid to contend in the second double-wide pack in the closing laps. And a final caution for a multi-car wreck gave Gaughan the opportunity to finish 12th at the line. The result was Gaughan’s second straight 12th-place finish and his fifth top-20 result in only eight starts with the plate-only team. A couple more underdogs cracked the top 20. The next was Ty Dillon, who brought Germain Racing to a 15th-place finish. Dillon may have qualified 29th, but his No. 13 was seen drafting near the front in the first stage, eventually falling out of the lead draft and taking it easy for a short time. Earning a stage point in stage one, Dillon stayed around for the finish, dodging the last-lap wreck to earn his first top 20 since Daytona in July. In fact, it was his third straight top 15 in plate racing, giving this team some rare positives in 2018. And finally, a career mark was in order for Joey Gase, the five-year part-timer who scored his best Cup finish from the 18th spot. His 28th career start was his fourth with StarCom Racing this year, tying their best-ever result in Cup. Just south of the to 20 was Chris Buescher. Similar to JTG teammate Allmendinger, plate racing hasn’t been too mean to Buescher after suffering a rollover in the past. Buescher placed top five in both Daytona races this year and finished 11th in the spring at Talladega. This time around wasn’t as kind but wasn’t that bad either, as he scored his eighth top-25 finish in the last nine races this year. Landon Cassill came home 22nd, giving StarCom two solid results in one race. Ross Chastain was two steps back in 24th, leading his first lap in Cup in the Premium Motorsports No. 15. In a day as strange as Sunday, these results won’t be listed under “B” for Bad Day. But, you can’t help but want more in the year’s last realistic opportunity for top 10s or better. One guy who did leave Talladega with a bad day, however, was Matt DiBenedetto. Running 10th across the white-flag lap, his Go Fas Racing No. 32 was spun out of line and slammed into the outside wall in a head-on impact. Sliding to a stop, DiBenedetto finished 30th. The good news from the week is that he will have a more competitive home in 2019 with Leavine Family Racing. Corey LaJoie had a quiet day, losing ground in the opening stage to fall off the lead lap. He finished two laps down in 32nd while DJ Kennington was 34th for Premium. JJ Yeley was the only driver who failed to finish on the day (!) leaving with a 36th-place finish after crashing out with three laps to go. Jeffrey Earnhardt brought out the opening yellow on lap 11 when he spun on the frontstretch. His No. 96 Gaunt Brothers Racing chassis was 37th while Cody Ware finished his first Cup race in his eighth start for Rick Ware Racing in 38th. Both Front Row cars qualified 14th and 16th and ended without a chance in 39th and 40th, respectively. The Camping World Truck Series hit the high banks on Saturday for the Fr8Auctions 250, an elimination race in the series’ playoffs. In the 94-lap race, one of the year’s best underdog stories occurred under the radar when Wendell Chavous crossed the finish line in the fifth position. This was more than just a top five for a small team. It was a career-best finish in a driver’s final NASCAR race. Chavous hung up his helmet for the last time following Saturday’s race, the 50th of his Truck Series career. 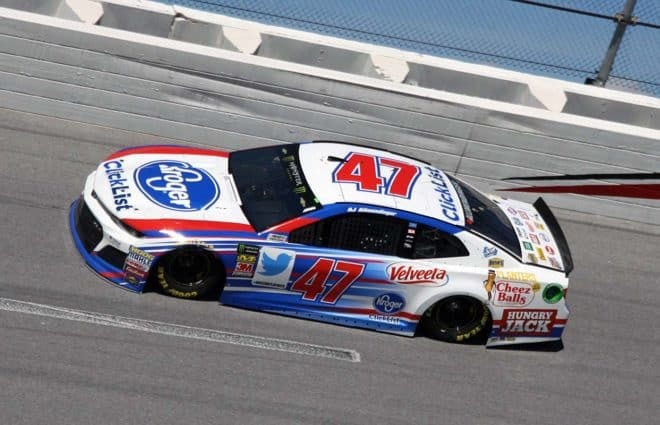 Running for Premium Motorsports, Chavous never finished in the top 10 prior to Talladega, ending that with a top five after the last-lap crash ended the race under caution. The result was the first-ever top five for team owner Jay Robinson in 112 Truck Series starts and his first in NASCAR since 2008 with Kenny Wallace in the XFINITY Series. Jordan Anderson scored his second top 10 of 2018 with a career-best seventh-place result for his self-owned No. 3 Chevrolet. Behind him was modified racer Bryan Dauzat in eighth, Max Tullman in ninth and Austin Hill, who led his first laps since his debut in 2014, in 10th. Jennifer Jo Cobb was 11th, earning her best finish since her lone top 10 in 2011. Another Top 10 in the books for our team. Enjoyed @TalladegaSuperS yesterday. We were very loose all race long but the @LFR95 guys worked hard to get me tuned up all day. Thought as we took the white flag we might be in good shape but lost all our helpers in the crash. Nice to grab a top 10 though!